Red Cross has organised the evacuation of stranded tourists in Patagonia. Flights are leaving the airport at 3pm. The roads will be open from 3-5pm today. Hotels in El Calafate in nearby Argentina are fully booked. 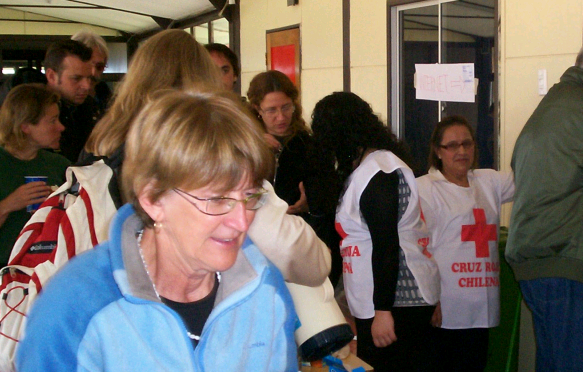 Tourists are registering at the Red Cross centre at the Natales school. Interestingly, my passport was stamped as exiting Chile so now I am in limbo. I talked with the strikers at one of the checkpoints. Apparently, the government had proposed a 20% increase in gas prices initially but had offered to settle at 3% or CPI but the strikers rejected that offer. The strike is led by a loose coalition of industry associations including taxi drivers and fishermen.